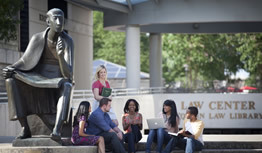 The University of Houston Law Center combines excellence, diversity and a great location in Houston, the 4th largest U.S. city and home to one of the world's largest legal markets. Learn more about the University of Houston Law Center’s J.D. and LL.M. programs. What would you like to see for the Law Center? Let Dean Baynes know. The Law Center's Career Development Office is here to help law students and alumni in achieving their career goals.